Last year, I had given a talk in an entrepreneur event on “Photography as Business”. I met a few people afterwards who came forward and inspired me to come out with my own book that could advise talented young entrepreneur photographer not only to run their business, but also to expand their business. Since I’m not an experienced writer, I decided to come out with my first e-book instead. At first, I do not have the confident to speak in public regarding photography business till someone gave me the opportunity. What my 1st ebook will cover? – Listen, Listen and Talk. Since this is my 1st ebook, I’m giving away FREE download. Only for 48 hours! 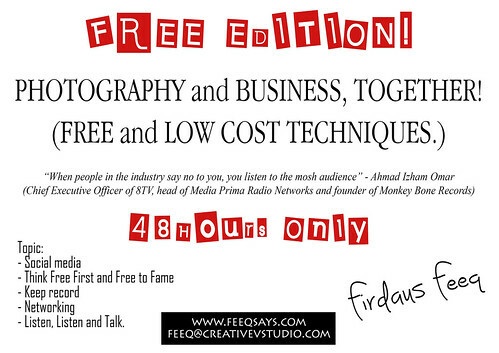 please drop you feedback at feeq@creativevstudio.com once you done read it.